Photograph of John Ivan Yanko and his brother Mike Yanko playing musical instruments. One brother is playing the concertina and the other is playing a guitar in a field in Kelliher, Saskatchewan. 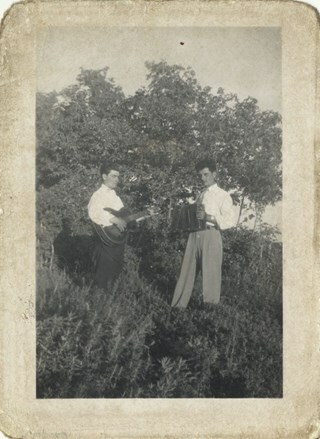 Note written on album page reads: "Kelliher 1947"
Note in pencil on verso of photograph reads: "Dad / Mike / Sask '47 / concertina"
Photograph of John Ivan Yanko and his brother Mike Yanko. Both men are dressed in suits. 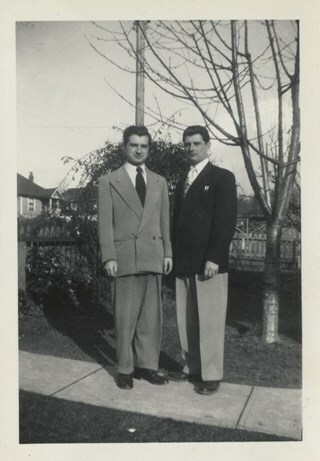 Note in black ink on verso of photograph reads: "John Mike / 12 March 1950 "
Note written on album page reads: "John + Mike'"
Photograph of brothers Mike, Joe and John Yanko. 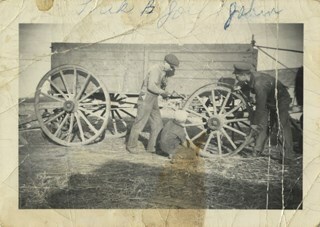 The brothers appear to be working together to repair a wooden wagon wheel. 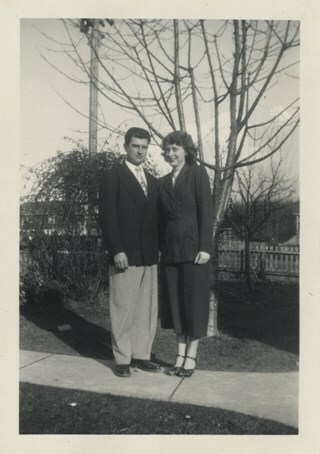 Note written on recto of photograph reads: "[illegible] Joe + John"
Note written in pencil on verso of photograph reads: "John and Joe [illegible]"
Photograph of Mike Yanko standing next to his sister-in-law Leida Doria "Lillian Doris" (Carman) Yanko. 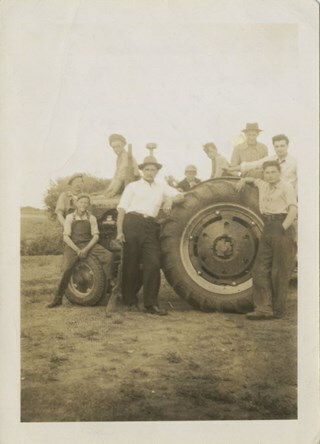 Note in black ink on verso of photograph reads: "Mar 12 1950 / Mike + Lil "
Note written on album page reads: "Mike + Lil'"
Photograph of members of the Yanko family standing on and around a tractor. Included in the photograph are brothers Nick, Fred, Mike, Peter, John and Joe with their nephews Gordon Kosloski and Eddie Yanko. Note in black ink on verso of photograph reads: "Nick / Fred Yanko / Mike / Peter Yanko / Johnny / Joe / Eddie Yanko / Gordon / July 1949"